Yardley Memorials will treat all enquiries with respect and privacy, we do not sell your data or give it to any third party. 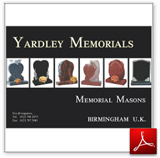 If you wish to send a direct email (not using the form) and have an email client set up on your computer then please contact us at peter@yardleymemorials.co.uk . Otherwise please use the online form be sure to write your full email address and please put your telephone number without spaces. Thank you for your interest. We will always do our best to answer your queries promptly, if for any reason you do not get a reply then please do call 0121 706 2473 during office hours.